There are four coverage trigger theories governing when “property damage” caused by an “occurrence” triggers a duty to indemnify the insured under a standard CG 001 insurance policy. They are: (1) exposure, (2) manifestation, (3) continuous trigger, and (4) injury-in-fact. Auto Owners Ins. Co. v. Travelers Cas. & Surety Co., 227 F.Supp.2d 1248 (M.D. Fla. 2002). Historically, there has been a conflict between Florida state courts and Florida federal courts applying Florida law about which trigger theory controls. State courts have applied the manifestation theory. For instance, in Travelers Ins. Co. v. C.J. Gayfer’s & Co., Inc., 366 So. 2d 1199 (Fla. 1st DCA 1979), the First District Court of Appeal opined that “occurrence” is commonly understood to mean the event in which negligence manifests itself in property damage. On the other hand, Federal courts have applied the injury-in-fact theory. In Trizec Properties, Inc. v. Biltmore Const. Co., Inc., 767 F.2d 810 (11th Cir. 1985), for example, the Eleventh Circuit Court of Appeals found there was no requirement that damages “manifest” themselves during the policy period. Instead, the Eleventh Circuit found it is damage itself which must occur during the policy period for coverage to be effective. 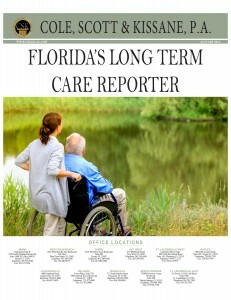 Although this is a very significant issue, the Florida Supreme Court has not addressed it. Recently, one federal court – the Middle District of Florida – held that the manifestation theory controls, diverging with prior federal circuit and district court holdings. That case was Mid-Continent Cas. Co. v. Siena Home Corp., 5:08-CV-385-OC-10GJK, 2011 WL 2784200 (M.D. Fla. July 8, 2011). However, subsequent decisions by the same court are far less definitive. See, for example, Axis Surplus Ins. Co. v. Contravest Const. Co., 6:11-CV-320-ORL-28, 2012 WL 2048303 (M.D. Fla. June 5, 2012), and Amerisure Mut. Ins. Co. v. Summit Contractors, Inc., 8:11-CV-77-T-17TGW, 2012 WL 716884 (M.D. Fla. Feb. 29, 2012). The Mid-Continent case is also interesting because it raises the issue of when a “manifestation” occurs. The Middle District held that the manifestation occurs when the “property damage” caused by the defective work is “discernible and reasonably discoverable,” and not when the damage is actually discovered. Perhaps the most important issue related to the trigger theory is the effect on the ability of a claimant to stack policy limits for successive policy periods when a continuing or progressive loss spans multiple policy periods. Under the injury-in-fact theory, absent exclusionary language to the contrary, multiple, primary policies can be stacked because each policy during which “property damage” caused by defective construction actually occurred provides coverage for the damage occurring during that period. Under the manifestation theory, a strong argument can be made that only one policy is implicated – the policy in effect when the damage to property other than the insured’s defective work first manifested. The issue has not been addressed by any Florida or Florida federal court. Neither court has addressed whether different policies could be implicated for different damages manifesting themselves during different policy periods, e.g. water intrusion around or through windows during one policy period and settlement cracking during a successive policy period. The recent Axis case has caused some commenters to proclaim that the manifestation theory’s days are numbered, and to embrace, instead, the injury-in-fact theory to allow more insurance policies to be triggered by latent property damage. 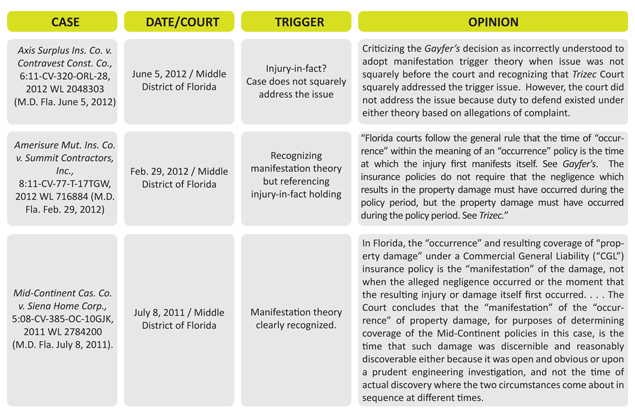 See The Manifestation Rule in Florida: Has Death Knelled?, Fla. Bar Journal, July/August 2013. We are not as optimistic. The trigger of coverage is “property damage” caused by an “occurrence,” and not the “occurrence” itself. For instance, if an insurance company provides consecutive CGL policies to a window installer whose windows are improperly installed, the policies triggered are those in effect when property other than the windows is damaged by improper installation, and not necessarily those in effect when the windows are installed. The Axis court did not explicitly reject the manifestation theory. The Court, though skeptical of the logic in Travelers v.Gayfers, 366 So.2d 1199 (Fla. 1st DCA 1979), avoided the issue by holding that the insured was owed a defense under either the manifestation or the injury-in-fact theory. A strong argument policy argument can be made that limiting coverage to the period during which the damage to property other than the insured’s work is first discovered promotes mitigation of damages. Otherwise, a claimant could be rewarded with stacking liability coverage for refusing to repair its property in a timely fashion. Given the uncertainty surrounding the trigger theory, with increasing frequency carriers endeavor to avoid stacking of coverages with “continuous and progressive injury or damage” and “known injury or damage” exclusions. There is currently one Florida case addressing the enforceability of these types of exclusions. In Mt. Hawley Insurance Co. vs. Dania Distribution Centre, Ltd., 23 Fla.L.Weekly Fed D379a (January 31, 2011), the Eleventh Circuit Court of Appeals enforced a “continuous and progressive injury or damage exclusion” endorsement to preclude recovery of a $19 million Coblenz judgment against Mt. Hawley. Florida courts reach the issue of which trigger theory applies because there is no explicit language in the standard policy defining the trigger. “Occurrence” is defined simply as an accident. “Property damage” caused by an “occurrence” is defined generally as physical injury to tangible property during the policy period. In general, Florida courts enforce clear and unambiguous coverage provisions, conditions, and exclusions in the insurance contract. Thus, one option is to define the triggering event to eliminate any ambiguity in the covered event – “property damage” caused by an “occurrence” during the policy period. It would be wise to define manifestation to occur when the damage to property other than the insured’s work is actually discovered, rather than when it could reasonably have been discovered. Pinning the trigger to when damage is actually discovered provides a more easily-identifiable trigger, thereby avoiding or minimizing the “battle of the experts” that can result in an inordinate amount of time and money being spent to simply determine whether the subject policy provides coverage. 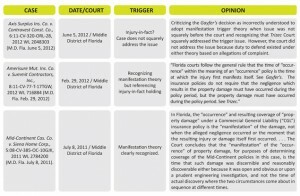 Defining the trigger to identify the event that creates coverage for “property damage” caused by an “occurrence” and excluding coverage for “continuous and progressive injury or damages” and “known injury or damage” are two effective strategies to hedge the risk created by this uncertainty in Florida law. With the explosion of construction defect and coverage litigation in the last two decades and another building boom on the horizon, the Florida Supreme court should resolve the issue in the relatively near future.